Ideas and Hypothesis are the starting point of all research. To trace them back, they evolve from a general pool of curiosity in the mind of the researcher. They begin as a disturbance in status quo and an intention to improve the present. Over a period this intention becomes very specific mostly related to the field of specialisation and takes form of a question which demands an answer with force of logic. This primordial question is then put into a vitriol mixture of rational thought process, current literature, lateral thinking and personal experience. Through this process the primordial question is transformed into a full blown Idea or ‘Hypothesis’. This is the seed through which the strong tree of ‘Research’ stems from and this is in no way a less demanding process than the complete research. In fact many research projects, when completed, may not appear satisfactory, primarily due to defects in the hypothesis which were overlooked and are now magnified at the end of the study. The health of the Hypothesis actually defines the health of the completed projects and ultimately their conclusions and their effect on patient care and advancement of medical knowledge and research. As convention only the complete research projects are subjected to peer review and are published in Literature with very few exceptions . I strongly believe these ‘Hypothesis’ or ‘Idea’ should also undergo a peer review process and be published before the actual research project is started. This will help in refining the idea and also assessing the quality of the idea. If the ideas do not primarily meet the requirements of scientific inquiry they may be rejected and unnecessary experimentation can be avoided. Of course this will be and should be through a stringent scientific peer review process and should have rapid publication time. Journal of Medical Thesis will be offering this platform to publish hypothesis and ideas related to all medical specialities. As mentioned above this will help in making good ideas better and also may filter out not so good ideas and avoid unnecessary use of resources. 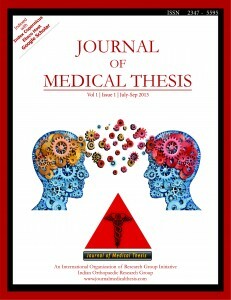 From this issue we are now accepting hypothesis, ideas, opinions and synopsis for publication in Journal of Medical Thesis. Guidelines for all of these are now included in the authors section, but the basic outline will consist on detailing what is the current knowledge, how is the new idea different form the existing context and how will it change the viewpoint with clinical benefits in mind. Lastly it should also outline how the experiment should be designed to prove the hypothesis. Although the idea of publishing hypothesis stems from an intention to improve the question so that we get better answers, it can also be viewed as an intellectual property tool. Intellectual property may be defined as legally recognised exclusive rights conferred to an individual over creations of his mind. Although an idea or a hypothesis is essentially an intellectual property by definition, it is almost impossible to register them before they are develop into a practically testable product or process that can be patented. Specifically in medical field it is very difficult and at times impractical to develop such a product or a process due to various reasons of which time availability for experimentation and resources available for research are main. Many a times this leads to authors shying away from publishing their idea and hypothesis. This may lead to a lot of delay in implementation of a potentially beneficial idea or possibly complete loss of the idea. If the hypothesis is published in JMT, it will not only be as good as a patented intellectual property but will also make the idea available in public domain and open to development by other researchers. Again any further refinement of the idea or hypothesis will always require the future researcher to quote and cite the original hypothesis paper in JMT. Thus such publication will act as a perpetual intellectual copyright of the idea and impart true credit to the originator of the idea. This has more relevance specifically to medical filed where many ideas or hypothesis are part of clinical skills, surgical expertise or patient oriented outcomes and may not be in any ways be ethically copyrighted except through publications in peer reviewed journals like JMT. Also after publication the idea will be read by many and may stimulate new ideas in minds of readers thus initiating a chain reaction ultimately leading to better and integrated ideas and concepts. The last part will focus on the concept of Defensive Publications. These are effectively means of defending ones Intellectual property rights by putting the idea or hypothesis primarily in public domain thus preventing anyone else to present patent consideration. Although these are most of the time used in pure sciences and technology and engineering fields and such publications can be more effectively used in medical field. For example, a surgeon or a physician over a period of time develops an improvement of existing technique of treatment of a particular disease, however he fails to publish it (probably due to reasons as stated above and other reasons why clinicians fail to publish). However what he does is that he presents it in conferences and shares with his colleagues. Any colleague from the audience can then potentially perform a study based on the similar technique and publish the results. The publication will be in name of the other physician rather than the original author who had developed the idea. Although it may also happen that two physician totally disconnected can have similar ideas at same times but again one who publishes the idea first gets the first credit and others have to be content with merely citing the original paper. Such incidences are not very rare and time and again I have heard from senior colleagues who have read a recent article and state that they have been using the similar surgical technique for years (but of course have failed to publish). Thus publishing the idea, hypothesis gives the researcher their rightful place as the originator of the thought process and helps defend against idea high jacking. Publication of hypothesis, ideas, and opinions will lead to improvement of the original idea, safeguarding of the intellectual property and protects the rights of the original thinker along with widespread spread of the idea thus accelerating the process from idea to practical process of clinical importance. JMT will provide all support to such authors and will have rapid peer review and publication policy for such hypothesis and ideas. Again through widespread use of open access online publication with creative common rights permissions we intend to make the publication reach the widest and relevant readers. However this will imply more rigorous peer review and more responsibility on the editorial team to allow only scientific and rational hypothesis and ideas to be published. We believe this will definitely add to the literature. With this I take this opportunity to invite scientific hypothesis, synopsis, ideas and opinions for publication in Journal of Medical Thesis. 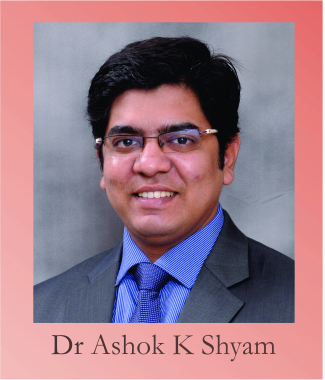 2.Shyam A K. Editorial: Journal of Medical Thesis: Research Education and Journal of Medical Thesis. 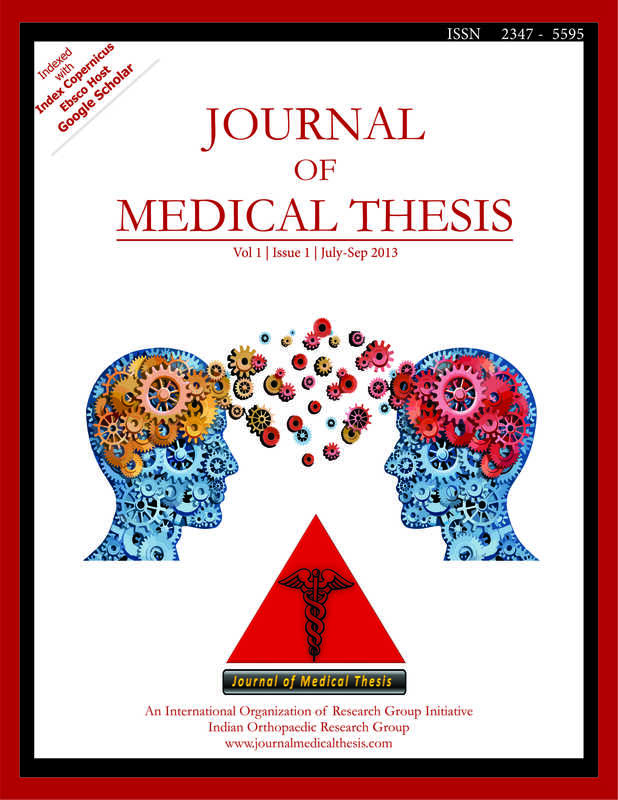 Journal Medical Thesis 2014 May-Aug; 2(2):1-2.